Rate this Article CyberSpace is no longer a world described in literature, movies or games. It's starting to scarily get real. Let's see why. During my very younger days, my Dad had this beloved hobby of his which literally turned our old house into a vibrating jukebox. He was what was called as an audiophile and Hi-Fi or High Fidelity was his passion. He had all sorts of audio equipment of the time like a turn table, various tape decks, amplifiers, mixers and a bunch of speakers. He had his collection of tape cartridges, 45's and LP's. Of course it was the 70's so it was an experience for me to hear Karen Carpenter or the Bread played with the volume really turned up. I grew up with some defective hearing as a result but hey, it was Hi-Fi! Looking back from today, it never occurred to me that Hi-Fi would stand for something else than that loud binaural music my Dad churned out with his equipment. Besides, the same songs with Hi-Fi sound could be enjoyed today by plugging a good quality headset to your PC and running "Baby I'm A Want You" on ones player app while writing articles like this. If my Dad could see me now. Hi-Fi/High Fidelity at it's present form has taken on a new meaning. It's a company, it's a VR graphics and interface app, it's a huge networked VR Platform and it' still the same awesome sound delivered to your headset. This time however, you can actually meet other people connected to it, probably find a girl you like from far away in the world and listen to the music of the Bread together. All you need is a Headset (for a full experience), a powerful PC and the World Wide Dweeb. 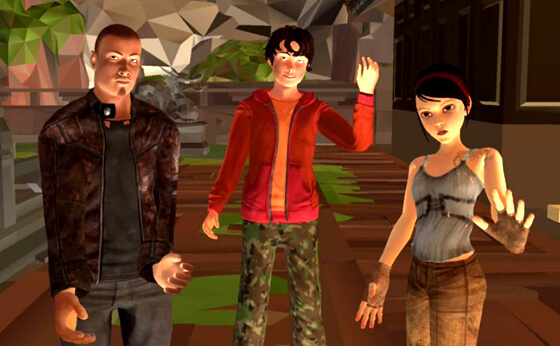 Founded by the trio of Philip Rosedale, Ryan Downe Karpf and Irena Freidrica Heiberger, High Fidelity, Inc. which is currently busy with the development of their High Fidelity VR App is working on a way to create a world wide reaching platform which could be described simply as a baby OASIS from Ready Player One. Well, that's what it looks like. In simple terms as possible, it's a big web network of VR worlds or rooms which a VR user can visit and interact with. The platform will also be Open Source (Clap your hands Johnny Mnemonic), and users will have the tools to create their own avatars (if they want to), create their own environment and graphic assets and most of all create their own worlds. Philip Rosedale is also responsible for the hit virtual world online simulator and community Second Life so this project may be sort of an extension of that social game platform into VR and yes, CyberSpace. The vision of the company is to provide an as much as possible all-in-one platform environment for VR where users can meet others, harness and share their own creativity, trade in VR as well as in real life, provide VR games and other experiences be it Social, Educational, Work Related, Marketing, Scientific, Business and Industry. A user could even tailor make his own fantasy world should he want to live there for the rest pf his life. The platform's objectives are awesome but we do have to take into account that it is still under development and may take a few years to fully grow. Despite this, Rosedale has been able to secure a huge amount of investment capital to the tune of $35 million in funding. Companies like Galaxy Digital’s EOS Ecosystem, Breyer Capital, Vulcan Capital, IDG Capital Partners and Blockchain Capital among others have invested. The project is very promising with a very huge projected potential as it will be able reach further than the currently running VR platforms. High Fidelity VR will be using BlockChain technology for it's network. Just as you can access BlockChain and do Crypto transactions world wide, the platform will be using the technology for their spread out servers, rooms, worlds and even monetary transactions. So, it would be like Second Life meets VR CyberSpace meets Crypto Currency BlockChain. High Fidelity will even be using it's own crypto currency known as High Fidelity Coin (HFC) and will have it's own Digital Asset Registry that will provide an indisputable proof of identity and ownership. This will all be done using BlockChain placing it outside the control of a single server or organization as every transaction and data will be decentralized. Bottom line, it's a fully functioning alternate world within a world and a hugely ambitious project as it will really bring CyberSpace to life as William Gibson described it. The platform will be focusing in providing very low-latency experiences (due to Blockchain) where user interactions will be as natural as can be. High quality graphics coupled with full motion capture real-time avatar movement will provide the fluidity required. Full-body inverse kinematics (IK) system will be supported. As for the VR worlds and experiences, they can be self hosted or uploaded to a public cloud service for other users to access (just like connecting to a multi-player game server online). High Fidelity will be able to bring hundreds if not a huge crowd of VR users into a single server and provide the same environment or experience to all. It would be like going to a musical concert in VR or battling it out in the Metaverse of Ready Player One. The VR app is available on Early Access at Steam. If you have a PC that reaches the requirements of the app, you can download it for free (as it will also run without a headset) but take note that it is still in development. It will however give you an idea of the OASIS to come as you can already start building and hosting your own world in VR as well as making friends, interacting and even trading with the users starting to use it. The company will be focusing in providing a very accessible marketplace for the users to avail as the platform develops. There are still a lot of bugs that have to be ironed out but the idea of CyberSpace as we know it wasn't built in a day and neither is the real one. If you've got an Oculus or Vive you can plug to your PC, High Fidelity VR Early Access is free2download on Steam. It's a realistic look-see of what CyberSpace is going to be. Besides you can always enjoy the awesome sounds with a good headset since it does reach your ears in Hi-Fi.